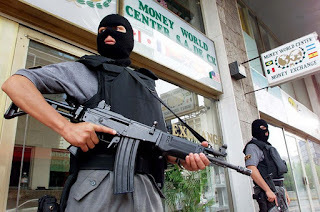 STRATFOR: "Operating predominantly in Juarez, El Paso and Mexican prisons, Los Aztecas have been functioning as the primary street gang for the Vicente Carrillo Fuentes cartel (VCF, also known as the Juarez cartel). Like most Latin American gangs, Los Aztecas are decentralized and are composed of various independently led cells known as "cliques." However, newly acquired information from Stratfor sources has sparked a reassessment of the relationship between Los Aztecas and the VCF." Milenio: The Federal Institute for Access to Public Information (IFAI) directed the Secretary of Defense to publicize the number of people detained by that agency during armed clashes with gangs linked to organized crime from December 2006 to September 2011." BBC News: "Unidentified gunmen have killed the police chief of the central Mexican town of Zacatepec. Juan Manuel Zamudio was shot by three men who ambushed his car as he was travelling alone in Morelos state." CNN.com: "At least 30,000 children in Mexico are involved in some sort of organized crime, according to a nationwide alliance of civic and social organizations. The Child Rights Network in Mexico says many of these children are taking part because of death threats or because of economic and social necessity. It is urging the government to start recognizing them as victims of child abuse." Milenio: "The Committee of Government, Constitutional Issues and Justice of the Standing Committee of the Mexican Congress agreed to create a bicameral commission to monitor investigations into the deaths of two students of the normal school of Ayotzinapa, Guerrero, which occurred during the police action on December 12. After another meeting with young normal school students at the congresssional Palace of San Lázaro, the working group appointed by the Standing Committee of Congress to address this case stressed its inability to deliver findings this month and thus raised the need to plan a new mechanism to give continuity to their efforts. The approach was endorsed by representatives of the three major political parties. The group also requested that the students of the Ayotzinapa rural normal school allow a visit of the deputies and senators to the school, but the youths made that conditional on progress in the response to their demands, including impeachment proceedings against the Guerrero governor, Angel Heladio Aguirre. ... Representatives of the various parties agreed to prepare the recommendation and vote next week, in order that the bicameral committee can be formally constituted on the eve of the opening of the regular session of the Senate and Chamber of Deputies." According to sources, the office has made clear that the shots that caused the deaths came from local police weapons, which is consistent with surveys conducted by the National Commission on Human Rights (CNDH). However, the federal prosecutor has not reached a determination of specific responsibility because of the absence of bullets that killed the students. The authorities stated that it is the responsibility of the Attorney General of Guerrero to identify and determine the responsibility of any person or group which made the shots, as the investigation into the crime of murder is in their sphere of authority. Similarly, respondents said the PGR has not provided all the expert reports to Guerrero's attorney general, because some stages of research are lacking." Milenio: The head of the State Attorney General's Office (PGJE), Juan Manuel Herrera defended the extension of the detention for the two ministerial police implicated in the case of the death of two students of the Ayotzinapa Normal School on December 12 of last year. The ten police released on Sunday are still under investigation because the case is still open. The extension granted by the judge of the first criminal court, Leoncio Molina Mercado, was because the attorney general is initiating criminal proceedings against the two policemen, Rey David Cortes Flores and Ismael Matadama Salinas. He explained that the extension of the detention was undertaken because it was close to the expiration time of the original detention and the two police would have had to be released. So he had to act according to the provisions of the applicable legal standard. He said that if the judge granted the extension, it is because his office provided the required elements to keep Cortes Flores and Matadama Salinas in custody. ... Regarding the six state protective police and four ministerial police released on Sunday, he said they are not fully exempt, as the case remains open, and they are free at the discretion of the law. He explained that besides the murder there are other situations that are going to be punished, because on December 12 some agents deliberately altered the crime scene, which will definitely bring legal consequences. He said that in the case there will be no impunity, which is the issue raised by the Ayotzinapa students in their recurring demonstrations. ... He admitted that the police did not act according to protocols for such matters, but noted that the responsibilities will be broken down in detail." IPS ipsnews.net: "The year 2012 started off with little promise for workers in Mexico, with analysts projecting job losses and wages below subsistence levels. Work prospects are even bleaker for young women, whose chances of finding a job are no better with a high school diploma or university degree. Carmen Ponce, an economist specialising in gender issues, says 2012 will be a "very challenging" year for Mexico in terms of job creation, as Chinese goods begin flooding the country as a result of the implementation of a trade agreement that opens the door to imports from that country. Ponce forecasts that some 100,000 jobs will be lost this year."